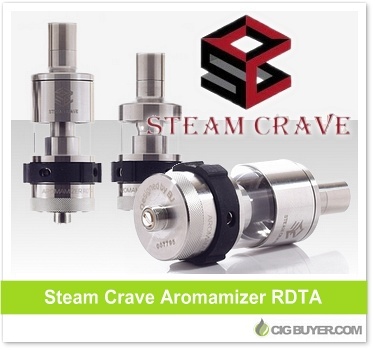 The Steam Crave Aromamizer RDTA is an innovative rebuildable dripping tank atomizer with a two post (Velocity-style) deck, bottom liquid feed system and direct side airflow, with 3mm airflow holes in quad or dual configurations. The design allows for independent filling and wicking, meaning the deck can be separated and maintained without the need to empty the tank. The Aromamizer’s drip tip is designed specifically to reduce spitback and enhance flavor, and it can be configured with either a 3ml or a 6ml glass tank.